For the past year, exhaust from MIT’s main power plant has been bubbling up through tubes of algae soup. The result? A dramatic cut in carbon dioxide (CO2) emissions—and abundant algae that can be turned into biofuel for the power plant or a diesel vehicle. Utility companies have been watching field trials of the algae-soup system with keen interest, hoping to combine low-cost exhaust cleanup with renewable-fuel production. One option is algae. These fast-growing, single-celled organisms gobble up CO2 during photosynthesis. Moreover, they split nitrogen oxides—a precursor to smog—into harmless nitrogen and oxygen. And they’re hardy creatures, thriving in conditions ranging from the Antarctic to the Yellowstone geysers to the Great Salt Lake. The installation on MIT’s 20-megawatt cogeneration plant demonstrates their abilities. Atop the plant are thirty 3-meter-high triangles of clear pipe containing a mixture of algae and water. Bubbling the plant’s flue gases through the mixture has reduced CO2 emissions by 82 percent on sunny days and 50 percent on cloudy days (during daytime) and has cut nitrogen oxides by 85 percent (on a 24-hour basis). Using algae to capture CO2 isn’t a new idea, but no one has found a commercially viable method of doing it. What’s Berzin’s secret? “We give an old idea a push with technology,” he explained. 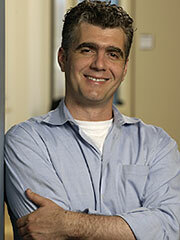 For example, Berzin and his coworkers “tailor” algae to perform well at a specific power plant. They use a terrestrial cousin of a miniature bioreactor designed for the International Space Station. As algae grow inside the bioreactor, their environment is gradually shifted to conditions they will encounter at the plant. Within three months, the tailored algae are thriving on flue gases instead of air. No genetic engineering is involved. “We just use the natural tendency of algae to adapt to any environment,” said Berzin. 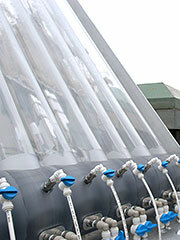 In fall 2005, the algae system was installed at a 1000-MW power plant in the Southwest. Initial field trials at the plant were successful, and testing is now moving into a pilot phase. Berzin estimates that more than 1000 power plants in the United States have enough flue gas, water, and land to host a commercial-scale installation. Many other industrial facilities would no doubt also qualify. This research was supported by grants from the MIT $50K Entrepreneurship Competition. 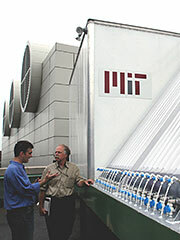 Inventor Isaac Berzin, left, talks with Peter Cooper of MIT's Department of Facilities during the installation of the algae system on top of MIT's cogeneration plant. The tubes to their right were subsequently filled with an algae-and-water mixture through which waste gases from the plant pass. As an MIT postdoc, Isaac Berzin developed a system that uses algae to clean up exhaust from power plants burning fossil fuels, especially coal.